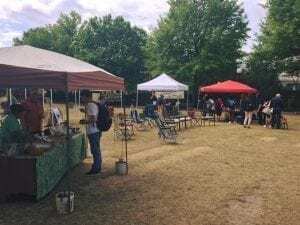 A “pop-up” farmer’s market is being held today from 12 – 3. The market is on Herty field at the University of Georgia. The market will last today from 12 – 3 on Herty Field. The group Real Food UGA is hosting the event to raise awareness and acknowledgment for the farmers who grow our food, and also to increase support for their Let the Big Dawgs Eat Real Food petition. The petition’s goal is to make 20% of current university food budgets go towards local/community-based, ecologically-sound food sources instead of industrial farms and junk foods. The petition’s goal is 1,000 signatures. There are currently over 500. Reporter Ryan Sander is at the market and will bring us details on the petition. Share your thoughts and stay updated through #RealFood4Dawgs.